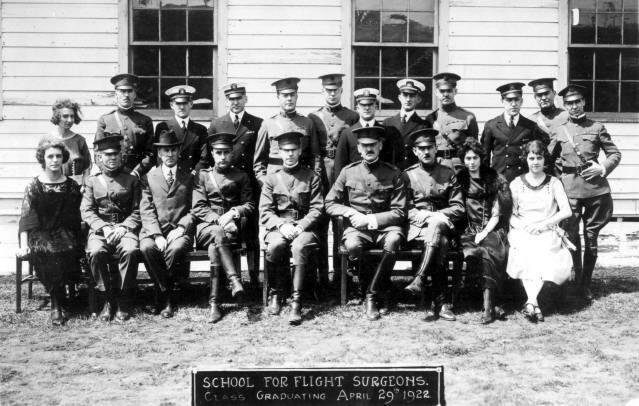 The U.S. Army School of Aviation Medicine was established in January 1918 on Long Island, New York. In 1921, the Navy began sending its first medical officers to be trained as Flight Surgeons. The first class graduated on April 29, 1922. They were Lieuts. Louis Iverson, Carl J. Robertson, Victor S. Armstrong, Page O. Northington, and Julius F. Newberger, (back row, left to right: 3rd, 4th, 7th, 8th, and 10th). Lieut. Armstrong was ordered to BUMED to become the first Chief of the Aviation Medicine Division in 1923. Their instructors included several who became famous in our specialty. Commandant Louis H. Bauer (front row, center), became the first director of civil aviation medicine for the Department of Commerce in 1926. Dr. Raymond T. Longacre (front row, to Maj. Bauer’s left), developed a comprehensive personality study used in selecting candidates for flight training. Dr. Edward Schneider (front row, 3rd from left), described a cardiovascular rating, the “Schneider Index,” for measuring physical fatigue and efficiency. Photo and research courtesy of Capt. Nicholas Davenport, referencing Hodge, W. A History of Aerospace Medicine in the U.S. Navy. Ch. 1; U.S. 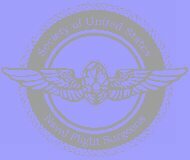 Naval Flight Surgeon’s Manual, 1st Ed. USGPO, 1968. CAPT Frank E. Dully, Jr.